Delayed gratification is a common phrase used to describe the act of investing. The idea is that an investor sacrifice their need for some consumable now and rather invest the money so that they can purchase a better version, or more of the same product, at a later stage. Other than this people simply invest to build an asset which will hopefully cover some other future expense or liability. Clearly from this it is obvious that the growth on your investment needs to at least outperform inflation. The bigger the outperformance, the better your purchasing power will be in the future. Should your investment fail to meet this criteria, you might end up saving for years without creating an asset that will match your liability/expenses. As a South African investor, you run a high risk of not achieving this objective. This is because a depreciation of our volatile Rand will lead to higher inflation and subsequently reduce your purchasing power. Many investors look at the performance of a local investment relative to that of an offshore investment and argue that local returns are better. Returns on South African assets are usually higher than those found in developed markets and it is simply because our assets offer more risk. Although returns might be higher, it might not necessarily enhance your purchasing power or make you richer. To test this , a back testing was done below on a rand based investment vs a dollar based investment. If we give each fund an equal weight in the portfolio, this portfolio of top local managers would have given you a performance of 4.7%. However, over this period, inflation came in at 5.48%. This investment would therefore have lost 0.78% in purchasing power over this short period. This may seem unfair to measure purchasing power created over such a short period, therefore I had a look at local asset performances over a 7 year period as well. The financial crises seemed like a good starting point. The table below illustrates the results. As a result of panic in global markets with the U.S. hiking interest rates and slower growth in China, all three of the Discovery offshore funds performed rather poor since it was launched. The table below illustrates that a portfolio of the three funds would have lost 5.45% over this period. However, because of the fact that you are investing in hard currency, you would have gained an additional 20.7% from the weakening rand on your Dollar investment. Thus over this period your purchasing power would have gained by 9.77% relative to purchasing power lost on the rand investment. Just as with the local investment, we will look at the long term effect of a Dollar investment as can be seen in the table below. It illustrates how a client’s purchasing power is enhanced by 8.4% p.a. This is 6.45% more than the annual purchasing power created by the local investment. Obviously the past year has been a once in a lifetime event with a combination of factors impacting global performance as well as the performance of the Discovery Offshore funds. Improved performance from the funds could only enhance your purchasing power further. To get a better idea of the expected future performance, we will look at the long term performance of the underlying instruments in these funds, since the funds themselves don’t have long term performance. These graphs might give one a better picture of the long term performance of the underlying instruments. The long term trend of the rand is also included as this is a key driver of returns. MSCI Core World UCITS ETF long term trend. MSCI Emerging Markets ETF long term trend. iShares Global Corporate Bond UCITS ETF long term trend. As one can see from all the above graphs, negative effects over the last years had a big impact on the performance of the Discovery Offshore Funds. The long term trend however looks satisfying. If you add the effect of the long term depreciation on the rand to the long term performance of the underlying instruments, one might be looking at a very lucrative investment opportunity. 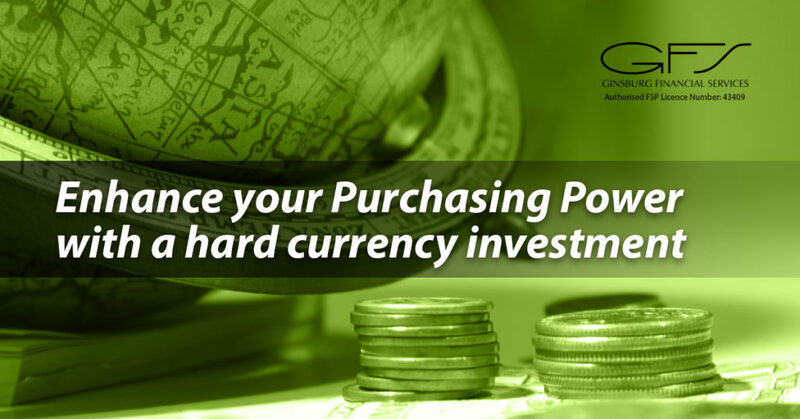 Purchasing power is enhanced when investing in hard currency. The rand should weaken against the dollar over the long term every year by the inflation differential (The amount SA’s inflation exceeds U.S. inflation by) of the two countries. This means that a hard currency investment can almost eliminate the effect of inflation which will enhance your purchasing power. Building a Dollar based asset, will give you the opportunity to cover your Rand based expenses with Dollar income, thereby eliminating a lot of the risk that we as South Africans are exposed to. Contact Ginsburg Financial Services for more information about Discovery Offshore Funds.